I recently had a few opportunities to test a few Zapco amplifiers and decided to post a review of my findings. I have been a Zapco fan since the 90s but on a high school budget, I was never in the right position to own any. But things changed soon after and there was a time when all I looked for were old school Zapco amps. 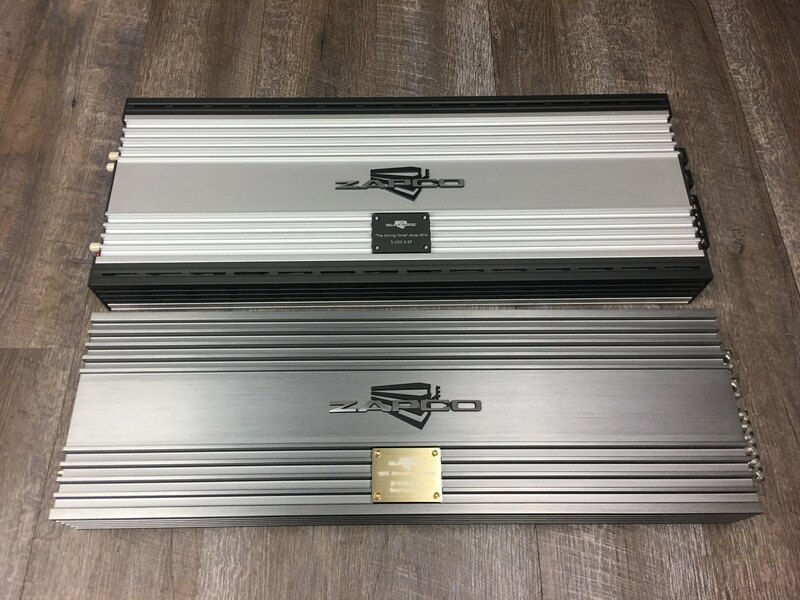 I have owned and collected many Zapco amplifiers and was always impressed with Zapco beautiful aesthetics, fit and finish, build quality, power, and sound. Fast forward to this year. I have not had the chance to play with any of the Z –LX Series until a buddy of mine purchased a Z-150.6LX and discovered that the caps were not the Elnas and Nichichons that was advertised. It caused a bit of commotion. 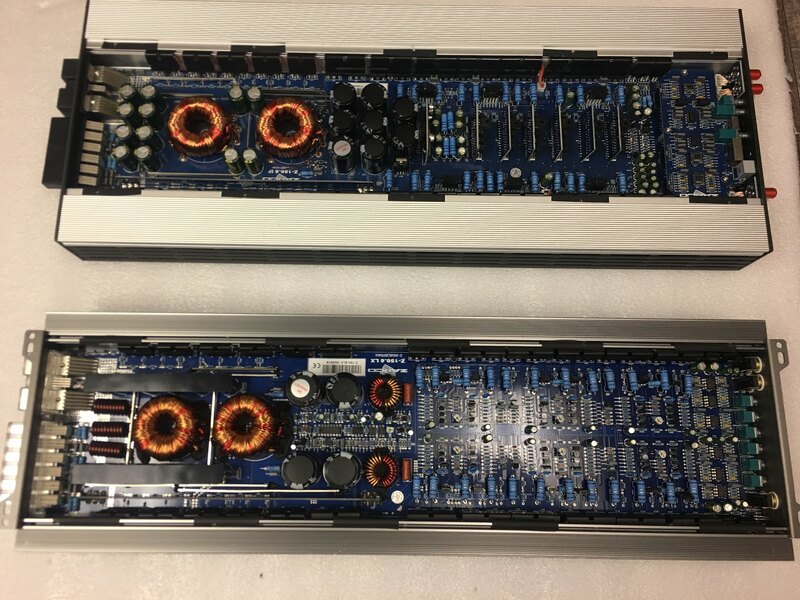 We found out that Zapco has been developing their own propriety capacitors and decided to use them in the new production runs of the LX series and in the new SP Series. "Old style LX (Elna and Nichicon Capacitors) vs New Style (Zapco Propriety Capacitos)"
A few months ago, I had the chance to compare a Z-150.4 LX (which had the Elnas and Nichicon capacitors) and a Z-150.6 LX (which had the new Zapco propriety). 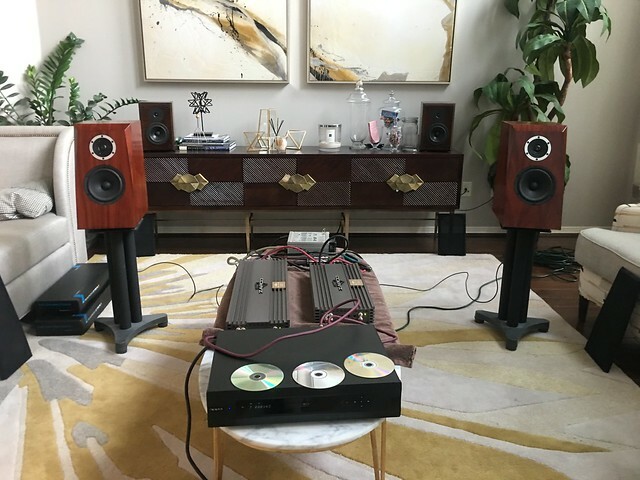 The setup was an Oppo BDP-95 player (known to be great sounding) running analog (Esoteric A7 RCA wires) straight into the Zapco Amplifiers. The Zapco amplifiers were powered off a Cascade power supply. The speakers I used for the test were a set of from Meniscus Audio that used Satori Speakers. Listening was conducted in my living room. Switching between the two amps did take about 3 minutes to shut down the power supply and to move the rca and speaker wires. Song choices were “The Best has yet to come” – Michael Buble, “Frim Fram Sauce” – by Diana Krall, “A Little Girl, a Little Boy, a Little Moon” by Diana Panton, and “Nothing Else Matters” – by Scala & Kolacny Brothers. After careful listening with a few songs I know well, the new amps with Zapco propriety caps did not sound bad it all. The sound is somewhat similar between the two style of amps. The difference that I noted was that new amp style had more “air”, emotion, and the ambience was really nice. For these reasons, I do prefer the new style over the old but I feel that you can’t go wrong with either choice. Zapco recently introduced the SP (Super Power) series amplifiers. The SP series was designed to maintain a SQ sound and built to play loud all day. Looking at the specifications, the SP series has a little more power per channel and achieve a better Signal to Noise ratio compared to the LX Series. The addition of thermal regulated fans (6 on the Z-150.6 SP) helps with any heat issues that may arise. The Size of the SP amplifier is a little bigger than the LX series due to the fact of the shroud where the fans are located. The SP series do have crossovers built in to the circuitry of the amp and the does not have individual gain knobs per channel as seen in the LX series. The fit and finish is very nice. The two toned chassis do add a very nice touch. I am in the process of a build I will work on later in the year and originally wanted to have 2 the Z-150.6 LX for it. Upon searching, Atrend notified me that the Z-150.6 LX is out of stock and they do have a hard time keeping them on the shelves. After learning a bit more of the SP series from Atrend, I decided to give it a try. The SP arrived the other day. After quickly going thru the manual, I was surprised to see that Zapco limited the frequencies in which channels 5 and 6 can play. It’s capped at 1000 hz and is meant for mid bass drivers and subwoofers. To me, it’s quite silly and limits the amplifiers flexibility. A good plus of the SP amplifier is the Signal to Noise rating is much higher than the LX. I had some time on Saturday and decided to do a sound comparison between the Z-150.6 LX and the Z-150.6 SP. I do not have fancy testing equipment so sound is the only thing I am able to test. For this test, I decided to use my trusty Sound Monitor DTA-500X and ICD-500X combo as the source. The analog outputs are connected to the Zapco amplifiers with a set of interconnects which uses the Cardas Crosslink wires and Eichmann bullet connectors. The power supply was the Cascade unit that I have. 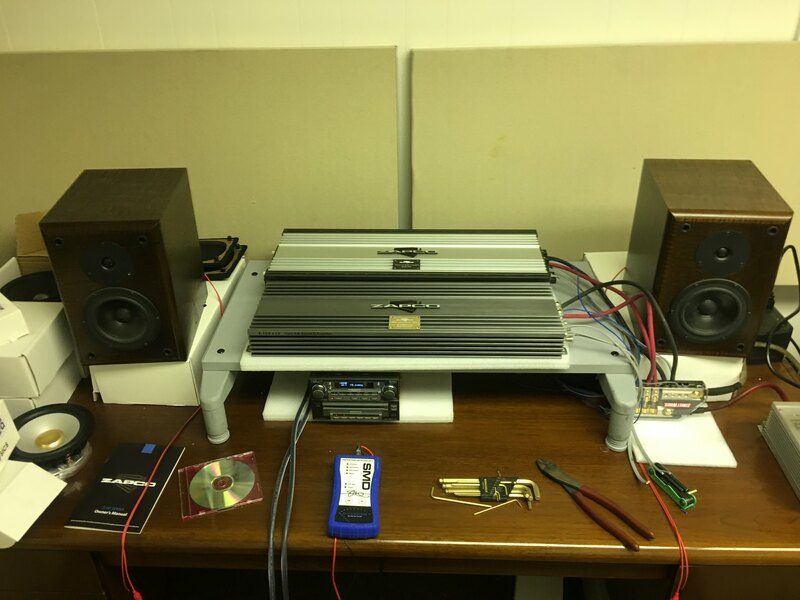 The bookshelves speakers that I utilized for the test is a design by a gentleman name Dennis Murphy and incorporates the Hiquphon OW-1 and a Seas CA15RLY woofers. These are my trusty pairs of speakers. They have a warm natural tone with a very nice open airy top end. I have used these for many years. For this test, I decided to setup up in my “tinker room” at our CNC shop. The main reason for the change was because of the look my wife gave me when she came home and found me testing the “old style vs new style LX.” The other reason is that the “tinker” room is well damped. Carpet on the floors and the ceiling tiles are special types that are somewhat studio grade and it does a great job with helping reflections and blocking out the noise of our manufacturing area. Testing on a Saturday was a great choice. We only had a fraction of people working and the bay where the room is located was inactive. Song choices were the same as the “new vs old style LX” test. I started listening with the LX series. Similar sounds from what I remembered from the last test. The LX had a nice warm, smooth tone with very good ambience. The lower midrange was a little forward but was not overpowering. Switching between the amps, I improved the timing by a method with the use of alligator clips to switch between the speaker leads. Switching between the amps took about a minute. After a brief listen to the Z-150.6 SP, I believe these are fantastic sounding amplifiers! The forwardness that I heard in the LX was not present. The stage is deeper and the separation was better. The layers in the stage were well defined and I loved the quiet delicate passages to the songs. In conclusion, I must say I am happy with the new SP series amplifier. It’s a great sounding amplifier. Built like a tank. My only gripe is is that Channel 5 & 6 is limited in the frequency range. If I stay with the SP series, I might buy a 2nd one to run my system. Please take my review on the amplifiers with a grain of salt. Sound quality is preference. I also do believe in synergy of a system where you match speakers to amplifiers to enhance there strengths. I wonder which Korean build house is making these now. Do you have any idea? I'd guess it's either Zenon or S&I since they are pretty much the only ones that don't always do catalog amps. Interesting subjective review. You statement "I loved the quiet delicate passages to the songs" tells me that you think the dynamic range is a little better on the SP line as compared to the LX line. To me, that is a huge benefit. And, you say the S/N ratio is better, as well. I am saving up for a Z150.6 LX, but had not considered the SP series. I may, now, be changing my purchase to a Z150.6 SP. I will have to do a little research on the SP line. i just cant take my eyes off those speakers.. I do not know sir. Agreed sir. I do not have a switcher for instant switching nor do I want to invest in one. Yes, Sound quality is a preference. Kind of like, how do you like your eggs. Also, some speakers can sound horrible paired to a certain components, but can definitely excel with others. I remember the v1 vs v2 discussion thread for the LX debacle, people were not happy with the lack of info....now fast forward to the SP line.... There is no information on what you described as a limited frequency range on channels 5/6. Can you imagine purchasing this thinking it is 20Hz - 20Khz on all channels, then realizing 5/6 is only good to 1Khz? While it would be practical for most users as is, there are some that would have uses for the amp other than standard 3-way or 2-way + Sub set-ups. Missing information like this is what can cause issues, just like the debacle when they changed the internals on the Lx models without any indication at all. Consumers are the basis of their business, and as such, every detail should be presented in clarity to know exactly what a person is buying. Yes, to me I see the quiet delicate passages as a plus. I love it. The S/N ratio for the Z-150.6 LX is rated at 90 while the Z-150.6 SP is at 104. If you can live with channels 5&6 being limited to 1000 hz, not having idividual gain knobs, and the larger chassis size, I believe this can be a great option. Especially if there is no Z-150.6 LX in stock. I did not hear the fans kick on so I can not comment on how loud they are. Yes, lack of info is not a good thing at all. I myself do not like surprises. The info on channels 5&6 is on the manual. Quick search, I was able to find it. Thanks Nick! I wish I have the skills to build them like that. They costs quite a bit for a one off like that in brazilian rosewood. While the information may be presented in the manual, on the website which gives the amp's specs, this is not stated and thus introduces a point of confusion. The info on the site and in the manual should be concise, not conflicting. Maybe I can email zapco . Good luck trying to get any info from Zapco direct. You'd be better off contacting Atrend. You can post here in the topic or open a new one and I guess John will answer you later. lostthumb - Nice review, it is nice to see that although people were very negative on the new caps - the results are better and you can't get wrong this amplifier, the SP amplifier is a piece of art and it is really an amazing amplifier, about channel 5&6 - need to make an update to the website. By the way - nice equipment. If I'm doing something after business hours (Pacific Time), I may not answer, but if I'm not doing anything, what the heck, I answer Saturdays too if I'm not out riding. About manufacturing. The first Z-Series amps were built in Korea, but the LX and everything after is being built in China. Mr Biasella (owner) has not lived in Italy in 6 years. He moved to China to keep total control of manufacturing. About 18 months ago the chief engineer also left Italy to move to China. The plant is a half hour down the road from the offices so they can keep a close eye on production. The goal is to eventually have everyone in China so we're across the hall instead of across the ocean. But I have a note from my mom, says I can't go. In the past I had heard a lot of bad things about Zapco as far as communications go. I bought my first Zapco amp last year. After a couple of months I had an issue with it and I was scared shitless after all of the things I had read. I contacted the shop that I purchased the amp from and told them what was going on. They then contacted Zapco. I had a new amp in less than a week. That was the only problem I have had with a Zapco product. However, I have been in contact with John many times about various things. This was both before I was on Team Zapco and after. He has always been very good about getting back with me. If I didn't have confidence in both Zapco and John I wouldn't be competing with their products. After seeing how things were handled with the cap incident I have full confidence in them. Quick question....do those amps come with birthsheets? Only Z LE (Limited Edition) came with birthsheets. The SQ 1350 was amp dyno’ d and doesn’t do rated at any ohm load whether certified, clipping, or dynamic... Makes me wonder about their other lines.. Was thinking to go with a z3kd II but now I am skeptical of performance. I have seen the LX 4 channel Amp Dyno and it does more than rated at all ohm loads and channel configurations !!! Thinking of grabbing a 4ch for my Audiofrog GB components. 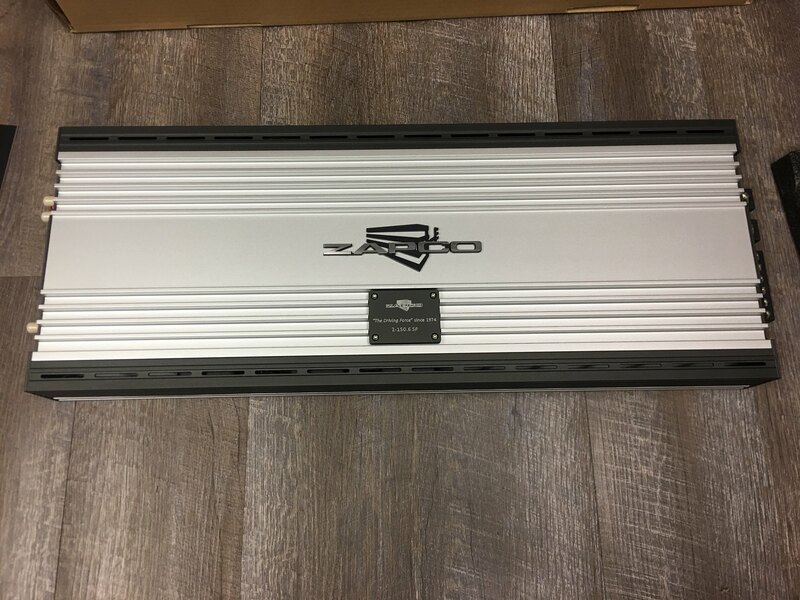 There is a dyno test for the zapco z150.4lx that bigdwiz did a while back and it did its rated power....although it is a class a/b amp vs. a class d like the z-3kd. I personally own a z-2kd and I am very happy with the amp as it has plenty of power and I am not running it at 1 ohm mono, instead I have 3 dual 2 ohm subs wired in series parallel for a 1.33 ohm load. 1.) 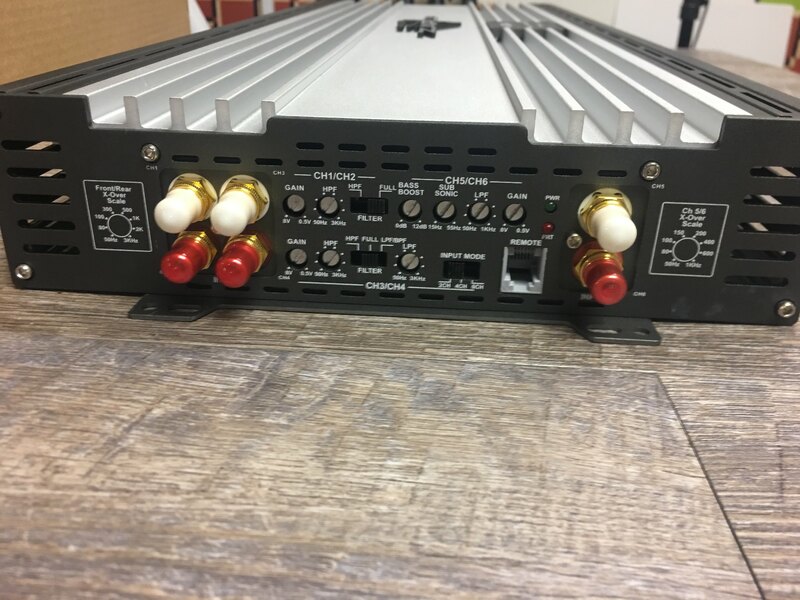 Any authorized Zapco dealers with Z-AP/ Z-SP amps in stock with pricing? 2.) I found some Z-II / Z-SP / Z-AP amps on Amazon & they seems to be sold by WoofersETC & TDH Global. Are these Zapco authorized internet dealers? The Zapco site only lists Atrend USA for where to buy & the pricing is higher. 3.) Has any Zapco users tried the Z-SP series? Or is the extra $200 for AP series justified ( seems to be some nice listed parts/ upgrades in Z-AP series. 4.) Running active with DSP would I even hear a difference between Z-II series and the Z-AP in a car (usually moving lol)? 5.) Is the Z-SP fan audible or loud? It says the Z-SP is geared towards a higher volume listener & all long periods of playing time vs the AP/ Z-II more Audiophile demo listening which is less demanding on the amp. 6.) Can the 6 channel Z-II/ Z-SP/ Z-AP be used to bridge 4 channels to 2 for AF GB60 mids & use ch 5 & 6 for GB15 tweets? I may go 3 way in the future, was thinking to get a 6 ch now. Idk if that’s too much power for the GB60’s? I don’t want to damage/ blow them.